Seattle, WA—It’s been a busy two years for Lisa Bridge (left), the incoming CEO of the 95-store Ben Bridge chain. Bridge, 33, is the fifth generation of Bridge family members to helm the retailer, now part of Warren Buffett’s Berkshire Hathaway group. Bridge was named president and COO last year; in November it was announced she will assume the CEO title after her father, Ed Bridge, retires in January. Bridge already has been putting her mark on the retailer, both in the stores and the merchandise. She directed the redesign of a key location in Seattle, and she’s created an eponymous collection of jewelry designed to appeal to fashion-conscious female self-purchasers. As both a woman and a Millennial—not to mention the youngest CEO in the store’s history and arguably one of the industry’s youngest key leaders—Bridge is in a unique position to both understand and act on the multiple challenges our industry faces today, such as appealing to Millennials and female shoppers, lab-grown diamonds, old and new luxury and more. In an exclusive interview with The Centurion Newsletter, Bridge talks about the future of the industry (she’s optimistic!) and how to adapt to market realities to make that happen. The Centurion Newsletter: You’re a unique position. Growing up in the industry you know how it’s always has done things, but as a Millennial and a woman, you understand two markets we desperately need to connect with for long-term success. Do you think the industry is doing enough right things to resonate with those consumers? Lisa Bridge: I am incredibly lucky to have grown up in this business, learning from my father, uncles, grandfather, and so many in our business and industry. The focus on taking care of our customers is the greatest legacy and one that drives us towards the future. It’s critical that we continue listening to what our customers want: how they want to interact, how they want to wear jewelry, recognizing that they want us to be successful. We have lots of opportunity to inspire our customers, we just have to speak their language. The Centurion: Do you believe Millennials don’t care about fine jewelry? Bridge: The desire for adornment, celebration, and marking special moments has been around for thousands of years, and that need hasn’t changed. How we connect, how we wear jewelry, and how we inspire customers continues to evolve. The total jewelry business in the United States is growing, not shrinking, we need to make sure that what we offer is compelling. The Centurion: How do you sell ‘forever’ to consumers who swap out their iPhone every year and turn over their wardrobes constantly? Other than bridal, do they even care about jewelry lasting forever? Bridge: I see consumers pushing back on that kind of disposable consumerism. They care about the cost to the environment and the impact of cheap labor. Today’s consumer, particularly a luxury consumer, is more selective about where they shop and how and they want to spend their dollars in ways that they can feel good about. What they purchase is a statement about who they are and what they believe. It’s the desire for fewer, better things. 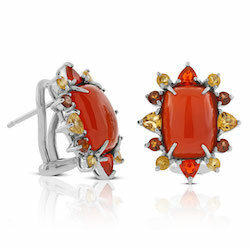 New earrings and ring from the Lisa Bridge collection at Ben Bridge. The Centurion: If Millennials are willing to swap out a $1,000 iPhone every year, there’s obviously money out there. Or are young people just reserving their only disposable income for experiences and electronics? Bridge: We have to inspire our customers and capture their imaginations. We have wonderful stories to tell but as an industry, we haven’t done a great job of telling them. Customers want to buy precious things and they want to feel good about it. We have something of value and meaning that can be a lasting legacy. 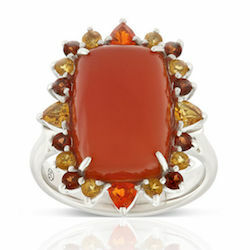 The Centurion: With increasingly casual lifestyles, what long-term trends have you seen in fine jewelry? Where do you think it will go? Bridge: People want jewelry that they can wear, that feels like it fits their life. The high-end piece that sits in their jewelry box only to be worn once a year doesn’t feel as relevant today. But casual doesn’t mean cheap or sloppy. To connect, we have to show customers how fine jewelry fits in to their lifestyle and how they can wear it. A simple white t-shirt can be basic, and it can be beautifully designed. Why shouldn’t the perfectly designed bar pendant accent it? The Centurion: Mink coats, country clubs, and the kind of gem-heavy high jewelry that you observed spends most of its time in the safe are examples of 'old luxury' products that don't resonate with Millennials (or even many Boomers). Meanwhile, ‘new luxury’ brands are emerging online that focus on delivering a high-quality product without the overhead or high-end marketing budgets. How do you see luxury for today’s—and tomorrow’s—consumer? Bridge: For many of these new brands, beyond just the ‘what’ they are selling, they are selling the ‘how:’ how it’s designed, how it’s made. Luxury today is about more than the physical item, it is what it represents and the story it tells. Ultimately, what we purchase is an extension of ourselves, what do we want our jewelry to say about us? The Centurion: Do you foresee the trend toward sharing, rather than owning, luxury as having a major impact on fine jewelry? If so, how can the industry benefit rather than suffer from the trend? Bridge: It’s an interesting trend. It’s fun to have something new to wear, but jewelry accrues meaning over time. I like to pull out a piece of jewelry and think of all of the adventures it has taken with me. You can’t do that if you have to return it in three days. The Centurion: Resale is a booming trend in luxury goods. Online resale sites are making luxury somewhat more accessible, and we’re seeing more second-hand luxury watches and jewelry being sold this way. 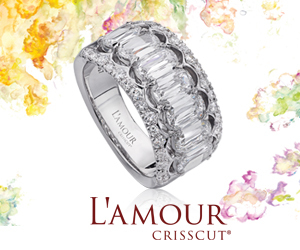 What impact do you see this having on the high-end jewelry market? Bridge: How wonderful for customers to see that high-end jewelry holds its value! 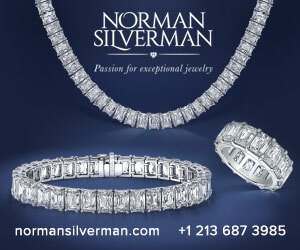 Making an investment in jewelry is a bit less intimidating if you know that you could make a change if you wanted to. 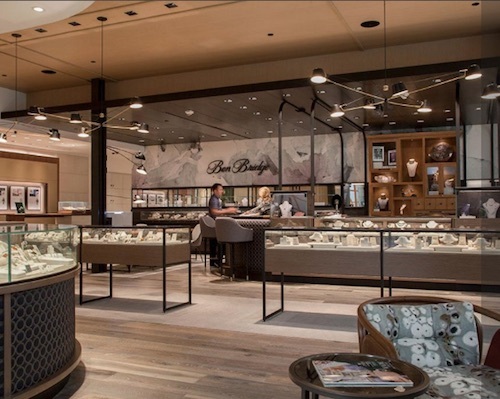 It also could be an entrée to the luxury world for a first-time customer, where they can fall in love with a designer, a style, or fine jewelry in general. The Centurion: What kind of impact do you anticipate lab-grown diamonds to have on fine jewelry sales? Bridge: It’s a choice. There are natural and lab grown gemstones available and customers can make the choice that’s right for them and the moment they are celebrating. For a symbol of something eternal, I want something truly precious, created by the earth. 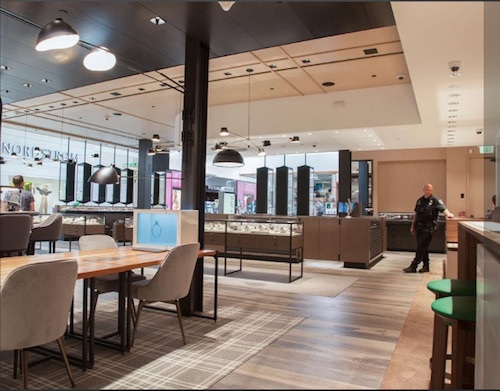 The Centurion: Can you address the key elements of your new store design model? Jewelry still has to be locked up, so what are you doing differently and what were your key marching orders to your new design firm? We wanted to create a space that felt engaging, warm, and unique to Ben Bridge. We examined each part of customer interaction and reevaluated our customer’s experience. There is a richness of details to the store that gives customers a reason to come back and visit. We also brought storytelling into the store through our design and how we display our jewelry. Love your new store and so glad that you are a part of our industry! I agree, building the story, the meaning and value is an important part our job, not just for the immediate sale, but to the public in general. We make lasting memories.